Fly in style by private jet hire to one of Morocco’s major cities, and be ready to experience the warming glow of Marrakech’s mosques and surround yourself in the hubbub and haggling of the plethora of markets. Marrakesh is one of the most wonderful locations for cultural enrichment; you are surrounded by mosques, markets, Moroccan art, museums, and of course an abundance of richly flavoured cuisine. Menara Airport in Marrakesh, is just a short 20 minute ride away from the intense sights, smells and sounds of this fabulous North African destination. Discover some terrific treasures in the labyrinth like markets of Marrakesh; let your eyes, ears, nose and mouth revel in the exceptional foods, colours and fabrics that line the streets. Be astounded by the deep, rich textured textiles that are carefully woven, sewn and carved to produce a transcendent result. 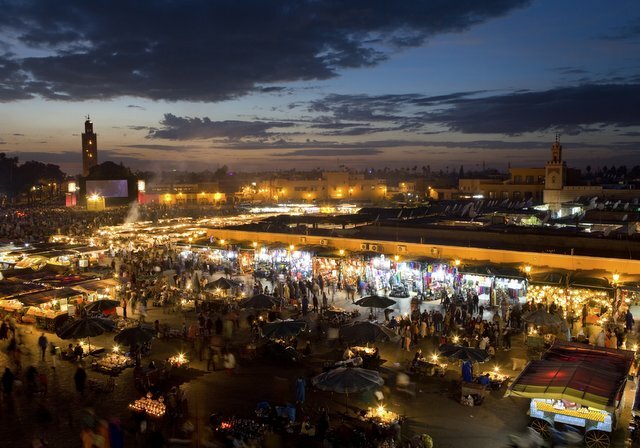 If you desire a slightly more commercial souk, head a little north of the Djema El Fna, to the area of the Medina. If you start by heading through the north edge and weave through the alleyways, you will soon uncover a seemingly endless number of intriguing stalls. Rue Semarine offers an eclectic bazaar housing a rainbow swarm of colour, overwhelming you with a variety of covetable items. Haggle with the sellers for beautifully woven carpets, aromatic spices, loose and light kaftans and even a number of magic supplies, for those of a little more superstitious nature. The largest mosque in Marrakech is Koutoubia Mosque, located in the south west Medina quarter. Standing ornately and prominently, it opens it doors to a large array of people from all over the world. Outside the Mosque you will bear witness to the immense structure. As the sun’s intense heat flows in a thick current around it, it glowers with strength, pride and might. Inside, you are surrounded by ornately carved arches, which create long, high ceilinged passages that seem to swallow you in their magnificence. Thick, rolling carpets line the deep channels, as you considerately survey the interior, your feet will sink in to the plush, rich red beneath. Norya ayroN, a French-Algerian designer, creates Moroccan-inspired women’s wear. Although still a fresh face in the fashion world, Maggie Gyllenhall, Juliette Binoche and Monica Bellucci, are amongst those who have been spotted sporting her elegant and feminine designs. Located at 32, Souk EL Jeld Sidi is Abdelaziz. If you are in search of some traditional Moroccan craftsmanship and contemporary styles, then this is the place for you. She generates her attractive creations using her trademark bold, flamboyant prints and high-end materials. To the south side of the Kasbah Mosque are the Saadian Tombs. Discovered in 1917, the Saadian Tombs are home to the gloriously, intricate mausoleum of Saadian Sultan Ahmed al-Mansour ed-Dahbi. No expense was spared in the creation of the Chamber of 12 Pillars, their splendour celebrated the Sultan’s life, death and wealth. Neglected since the seventeenth century, the Sultan’s glorified place of rest was only discovered by aerial photography hundreds of years later. Another of Marrakesh’s principal monuments from the Saadian era was the Sultan’s principal residence, the Badii Palace, built by Sultan Ahmed El-Mansour. It stands now a discarded ruin, but it once stood proud and ostentatiously, with gold encrusted walls and ceilings encompassing pools and fountains. Delve in to the some traditional and exclusive Moroccan cuisine at Comptoir Darna. Surrounded by a fiery and voluptuous ambience, you will be greeted with a delicate blend of flavours, ranging from subtly sweet to spiced refinement. Comptoir Darna accommodates many palettes, and will provide you with an unforgettable meal. As well as a delectable, and fragrant meal, there is an outside area, so you can enjoy the warmth of a Moroccan evening. Fusing the traditional with the eclectic, Comptoir Darna delivers something for everyone, including a club at the top of a grand staircase, allowing you to continue your brilliant evening into the early hours.